If you have a little girl, or boy in your house who loves to use their imagination then the Ladybug Girl series is for you. 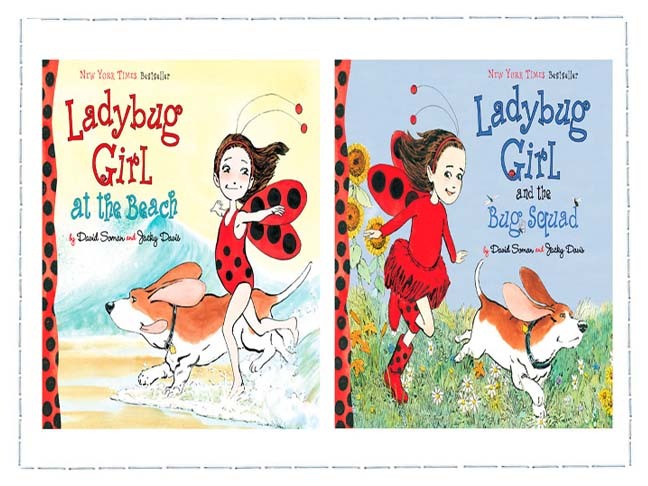 In these fanciful books we meet Lulu, aka Ladybug Girl, who loves to dress up in her ladybug costume and use her imagination to turn every moment into an adventure. Through the use of fun pictures full of child like energy coupled with stories kids can relate to, David Soman and Jacky Davis have created a new favorite character to follow. Keep the summer feeling long into Back To School with Ladybug Girl at the Beach. In this fun filled summer adventure Lulu knows she loves the beach, even though she has never been before. When she finally arrives on the sandy shore she is surprised by how big and rough the ocean is, not to mention it tries to steal her favorite pail. That’s when it turns into a job for Ladybug Girl! As school starts up again play dates are penciled into the schedule. Let Lulu help teach your kids about saying your sorry in Ladybug Girl and the Bug Squad. Lulu has all kinds of things planned for the Bug Squad to do when they come over for a play date. But, there’s a hitch in the plans and feelings are hurt making apologies mandatory. Luckily Ladybug Girl comes to the rescue showing that it is an act of bravery to admit you were wrong and say you are sorry! Don’t limit your child to just the books though, there is a whole Ladybug girl universe for them to explore. Jump through to check out the official website or try playing the Ladybug Girl Game or the Bug Squad Rock Painter. Heading to an end of summer BBQ? Print out the free printable coloring sheets below and let your child add color to Ladybug Girl’s summer scenes! Because we love Lulu and we think you will too we are giving one lucky winner a Ladybug Girl Prize Pack and all you have to do is leave a comment below telling us what your child’s favorite bug is, or click here. This prize is valued at $133 and open to residents of the US (except Rhode Island) over 18 years of age.